As Blues suffered their first defeat in five games at Ashton Gate last night, there was a strange feeling of relief. One glance at the other results suggests that Blues have got away with it this time. For what it’s worth, the better team won. Yet, without meaning to sound like Steve Cotterill, if Blues had made the most of their chances the outcome could have been a whole lot different. After a bright start, Marlon Pack’s 12th-minute opener knocked the stuffing out of Blues. The second, scored by Bobby Reid 15 minutes later, seemed to wake them up. 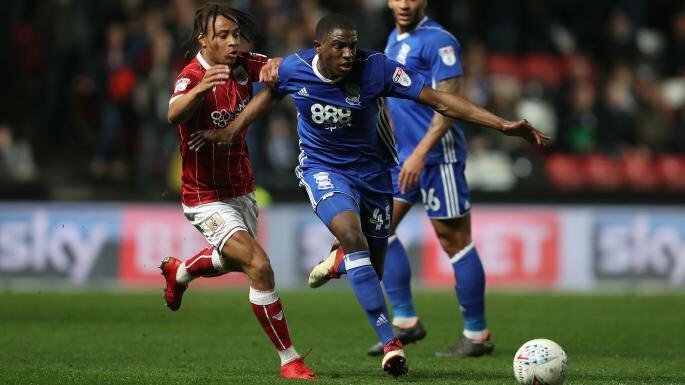 A string of decent openings were squandered – Jacques Maghoma, Lukas Jutkiewicz, Jeremie Boga and Jota all guilty parties either side of Reid’s sucker punch – but Garry Monk will be relatively pleased with the intent and response of his team. Jutkiewicz did pull one back 10 minutes before the interval – his third in three games – with a clever snapshot which caught Frank Fielding by surprise. The second half could have gone either way. Jutkiewicz came close with a header and youngster Bez Lubala almost created something from nothing with a speculative shot from distance. The hosts also had their chances through Pack, Reid and Joe Bryan. The game was finally put to bed in the 84th minute when Matt Taylor slid the ball home despite claims for offside. With Blues’ good run of form coming to an end, the reliance on other results was stark. With Bolton, Barnsley and Reading all suffering defeat, not much has changed for the time being. However, Monk takes his men to Molineux on Sunday lunchtime as huge underdogs as Wolves look to get their promotion party started. Its good to see us creating chances away from home; not something we have seen very often this season. So we are still moving in the right direction under GM, even in defeat. We are moving in the right direction,just a pity Monk wasn’t introduced a few months earlier.My gut feeling is that we have left it too late with daunting games remaining.44 points may well save us but where are they coming from? Freak results have happened in the past and we,as Blues,can defy logic at times with the odd crazy result-e.g. Wolves 0 Blues 1. this Sunday? Could it be. Bolton and Barnsley play each other on Saturday so both cannot overtake us. Which means we cannot be in bottom 3 even after Sunday’s game whatever the result. Wolves will win promotion if they beat us. Let’s hope we can put the champagne on ice. Bolton play Wolves after us which could be the championship decider game. Barnsley’s game in hand worries the hell out of me. Ijaz.Barnsley IMO,will survive especially with their superior goal advantage.Bolton or ourselves is the issue.Sundays game at Wolves mustn’t end in an avalanche of goals to give Bolton a real goal advantage.If we can get to the Sheffield game with Adams back and in reasonable shape after Wolves,then we stand a fair chance.Also,let’s hope Fulham are promoted before our final game .As regards Bolton v Wolves,this game is twitchy for me as if Wolves are already promoted etc.what do we expect from Wolves that day.We are all sponged out I know with this and if I am honest,the stage has come for me where I am wanting the season over whichever division we end up in. Final relegation spot will be 44points.Although 43 would do it for Barnsley.We need that extra point.